Google has renamed Local Business Centre as Google Places and launched several new features, most of them not available to Canadian businesses just yet. The re-branding launched April 20 to emphasize the link between Place Pages and the dashboard business owners use to control the information they share on Google. Launched last September, Place Pages are an extension of Google Maps that presents information about a business, such as hours of operation, a description, photos and videos. Google’s local services are quickly becoming akin to the Yellow Pages of the Internet and have gained more prominence in standard search results over the past few months. One out of five searches on Google are related to a user’s location, Google says. The search engine delivers results based, in part, on a user’s location, found using the IP address. Now the business management console has a different name and some new toys. Businesses won’t notice too much change other than a new banner at the top of the page, says Cameron Wilson, a partner with RankHigher.ca, a Burlington, Ont.-based search engine optimization firm. But the consumer user experience will be better. “It’s now not a separate product from Maps, but an integrated product where a user can go on the Maps and find out what’s near them,” he says. Canadian businesses can still expect a Web traffic boost from using Places despite not having access to all the new features. One new feature available immediately to Canadian businesses is “service areas.” Businesses that travel to serve customers can indicate the geographic areas they cover. Also, businesses that don’t have a public storefront or office location can opt to make their address private. This is most useful for home-based businesses that want some extra privacy, Wilson says. He recalls how a dog breeder was frequently confronted by animal rights activists for raising purebred dogs. Now such a person would be able to indicate the city they serve without sharing where they live. New features available in select U.S. cities include Tags, business photo shoots, customized Quick Response (QR) codes, and an expanded Favorite Places program. The new features can be managed along with other information at google.com/places. Bookmarks to the old URL will continue to work. Canadians can sign up to learn when Tags become available in their city, Rozeluk says. 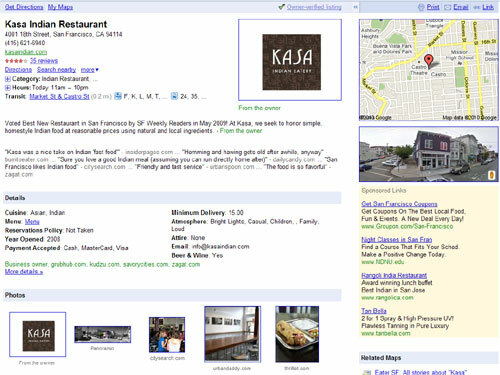 The new advertising format charges businesses $25 per month to place icons next to their name on Google Maps. The icons help a listing stand out from the competition and indicate extra content, such as video. When this new feature does come to Canada, it’s best to get in on it early, Wilson says. But be sure to promote a well-constructed profile. 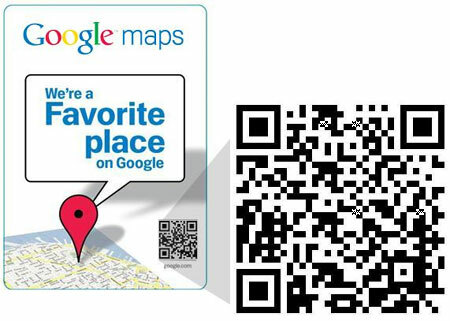 Google will issue businesses customized QR codes that can be placed on business cards or other marketing materials. These are square bar codes that can be scanned by certain smartphone applications. The person who scans the QR code would be taken to the mobile Places page for that specific business. Google is expanding its Favorite Places program to include 50,000 more U.S. businesses. These shops get a window decal with a QR code. It’s all geared to help smartphone users find information while on the go, Rozeluk says. But time will tell if the cryptic squares really catch on or not, says Wilson from RankHigher.ca. Finally, Google’s business photo shoots will allow companies to request that Google’s Streetview team come and take photographs of the inside of their storefront. This will allow people using Google Maps to dive into a storefront off of the street.